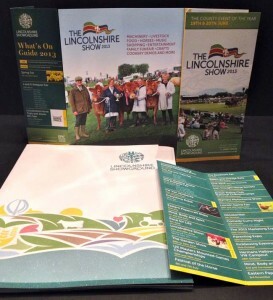 Working with Optima Design, Pyramid produced several exciting promotional pieces for the Lincolnshire Showground. These items were printed on 100% recycled uncoated stocks, again Pyramid’s stringent quality control procedures ensured that colours across the suite matched. Continuing Pyramid’s quest to maintain the worlds forests we suggested that the brochure should carry the FSC® logo, promoting our and our clients ethnical standing on the sustainability of the world forests. Our client was equally impressed with the finished product and service levels throughout the project. But were blown away when we delivered in 12 digitally printed copies, of the brochure, for an important shareholder meeting, whilst the main litho run was being produced. Jas, from our sales team, along with a few friends, ran the Lincoln 10K raising much needed money for Prostate Cancer UK. Wanting Jas to stand out from the crowd, we designed and produced him a personalised T-shirt. The team all achieved sub 60 mins, and raised over £1,000 for Prostate Cancer UK and Pyramid are proud to have sponsored them. Jas is will continue to wear his t-shirt when he runs the Woodhall Spa 10K, Nottingham’s Water Wipeout 10K Mudrun and the insane 12 mile Tough Mudder, promoting the services of two excellent organisations. Jas is pictured below with his teammates.